And where did we came from and how we got here!? 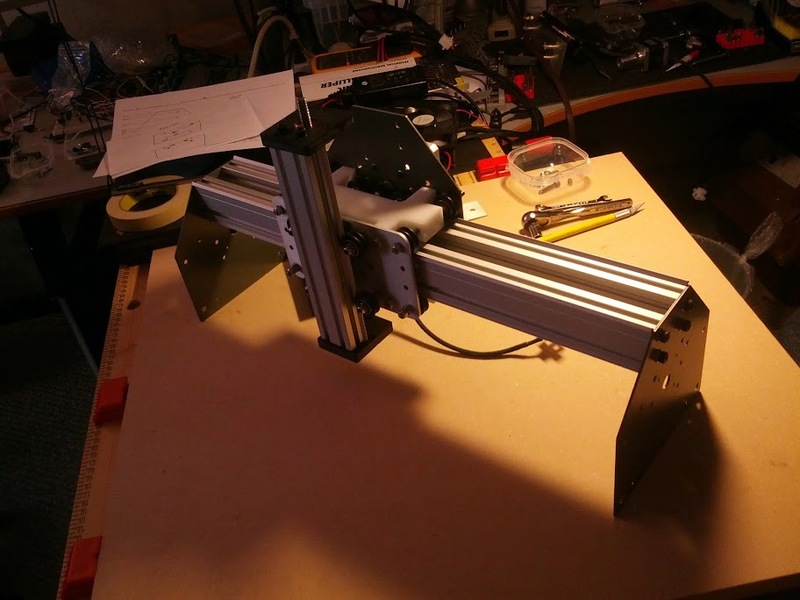 First time completed assembly and test the good old days (3 months ago)..
Withe the double beam on the X-axis gantry there was a little parallel play between the back plate and the front plate holding the Z-axis. 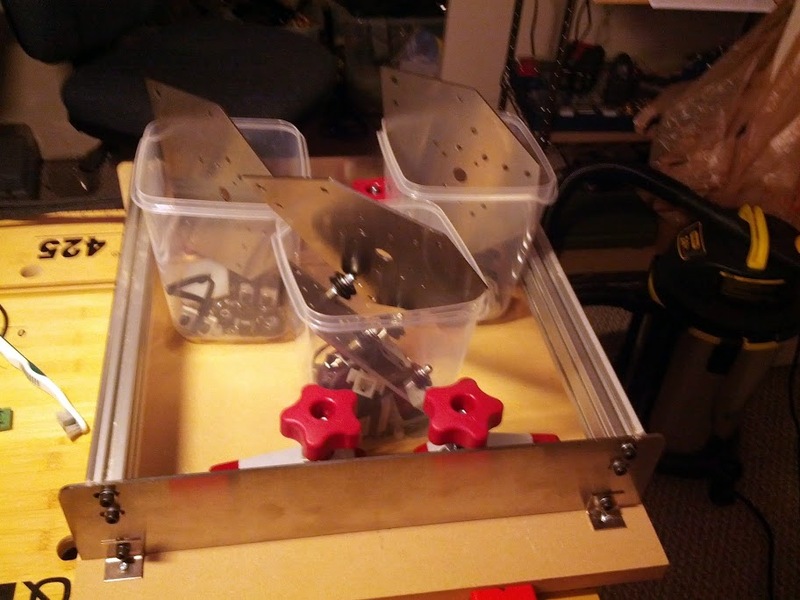 I solved this by adding HDPE pieces to form a solid block instead on relying only on the screws to prevent the parallel sliding of the plates from one an other. The double beam is probably too much for this size, I am experimenting as I will like to go wider later 1000mm or larger (why not), also get more rigidity on the gantry. 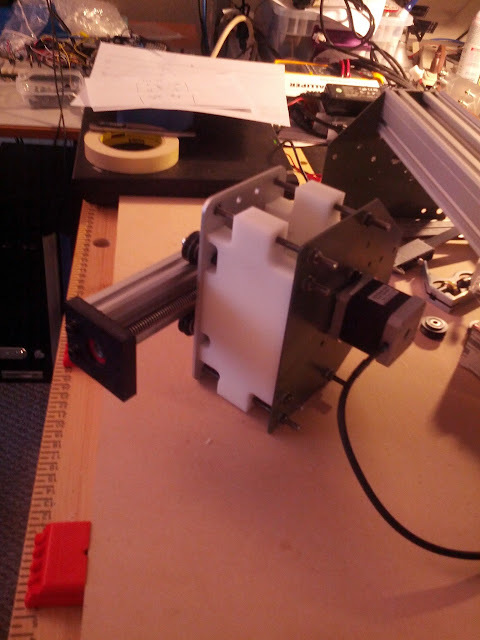 Almost there, also changed the Spindle mount. 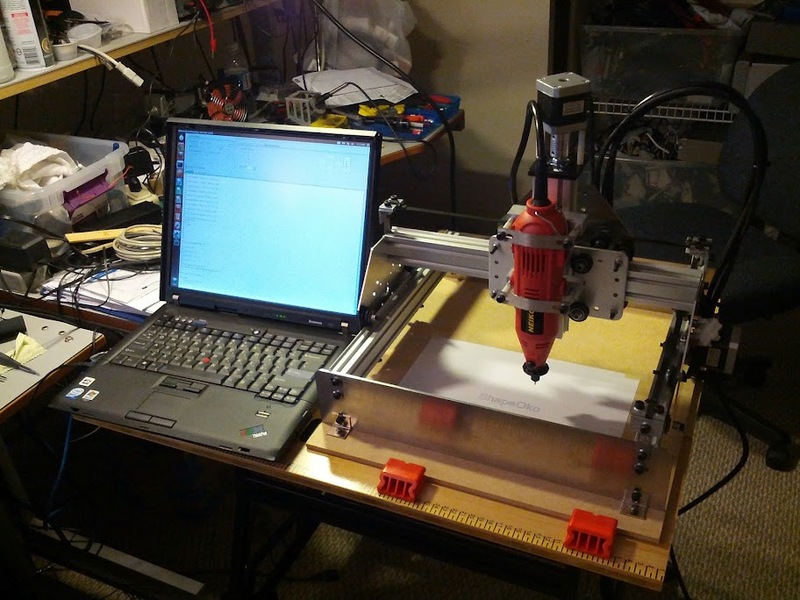 Now one of the things I want to use my machine for is milling PCBs. I have been playing around with different settings trying to get a good hold in accuracy and repeat-ability. 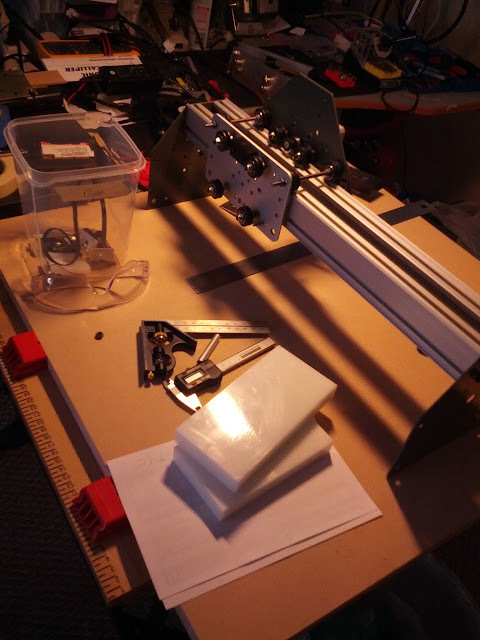 I am using single stepper drivers TB6560 type (this is not the 4-axis controller or nothing like that, they do have the good fast optos) the steppers motors are the ones form Sparkfun Electronics 400/rev (0.9 degree per step). Last edited by wlanfox on Thu Mar 14, 2013 10:04 pm, edited 2 times in total. The slabs of hdpe between the x plates is an awesome solution for dual x rails! Archangel wrote: The slabs of hdpe between the x plates is an awesome solution for dual x rails! I like the plastic parts very much, but what piqued my interest where the bolts. Where on Earth did you find fully threaded cap screws that long? Those are really great mods! I'm so jealous how clean yours looks. It's really nice. 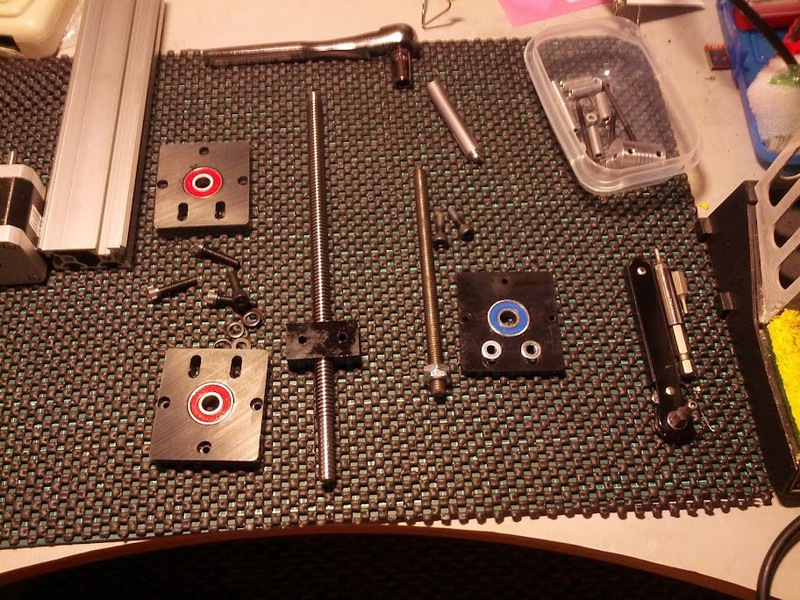 What extrusions did you use for the T-slot table? Where did you get that e-chain! It's sweet. I think that piece between could be made as two pieces with pocket cut for the joining bolt holes. Put together the pockets would become channels, and then the two pieces could be bolted together from the top/bottom. This way no manual drilling would b required. 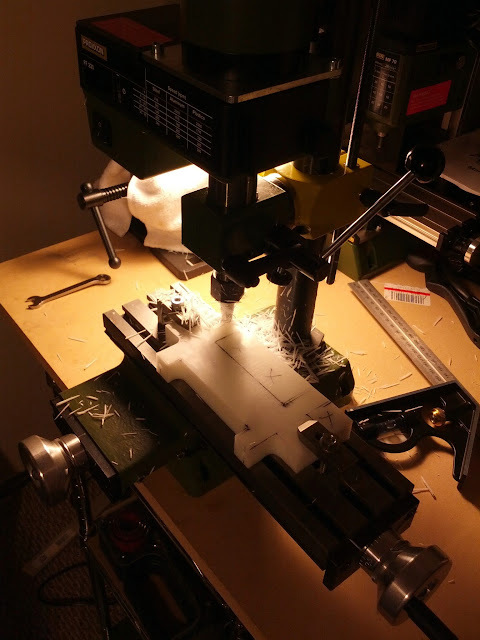 Shapeoko 1 #0 - a couple of upgrades. 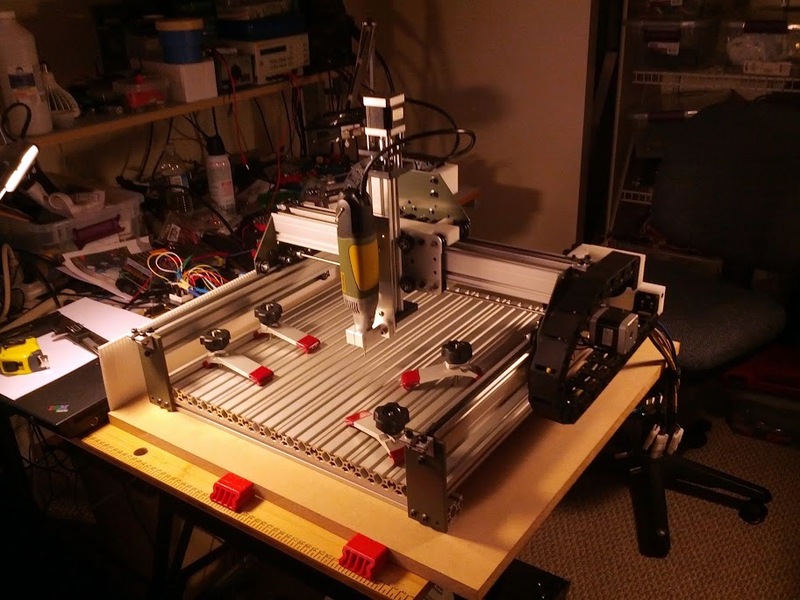 Shapeoko 2 #0 - a couple of upgrades. cvoinescu wrote: I like the plastic parts very much, but what piqued my interest where the bolts. Where on Earth did you find fully threaded cap screws that long? The extrusions are 8 x 495mm length profile 5 (got them on ebay by a store or seller items), I wanted the dimensionless to be the same profile as the makerslide, these are 20mm height x 60mm wide, I got two 20mm x 40mm x 500mm extrusions from inventables these are where the 4 end-plates attach to and all 8 extrusions also bolt down to. The e-chain I got on ebay... 1000MM Cable drag chain wire carrier 18*25*R28/R38/48 http://www.ebay.com/itm/220901343363?ssPageName=STRK:MEWNX:IT&_trksid=p3984.m1439.l2649. 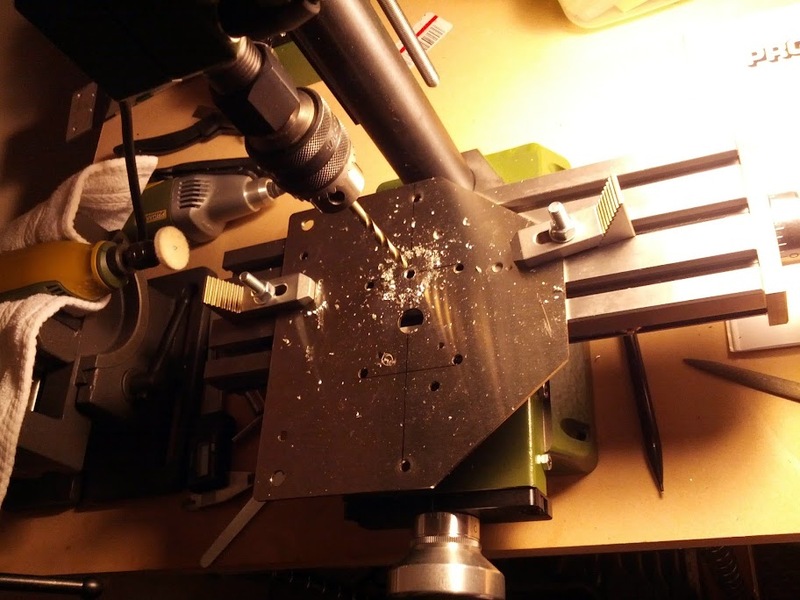 Using pockets to joining the middle pieces its a good idea, because it took some tinkering to get the drill all the way across, if this could be avoided it will be great. Cool build!!!! How is the shaft drive working out? rpe wrote: Cool build!!!! How is the shaft drive working out? So far no issues, I am using stainless steel rod; I can see there is a little give (rod has a slide "U" shape) if I tension the belts too much. This is of course because the idle wheels are below the drive pulley and every time I tension the belt I am basically pulling down on the pulley. But I am working on a fix for this issues. If one looks closer at the problem this is because that the rod is only held at the ends. One possible fix is to add two more bearings to hold the pulleys on both the outside and the inside side. I was thinking about creating dust covers for the Y-axis wheels and just happens that this will also add a mounting point for a second bearing in the inside side of the pulley. 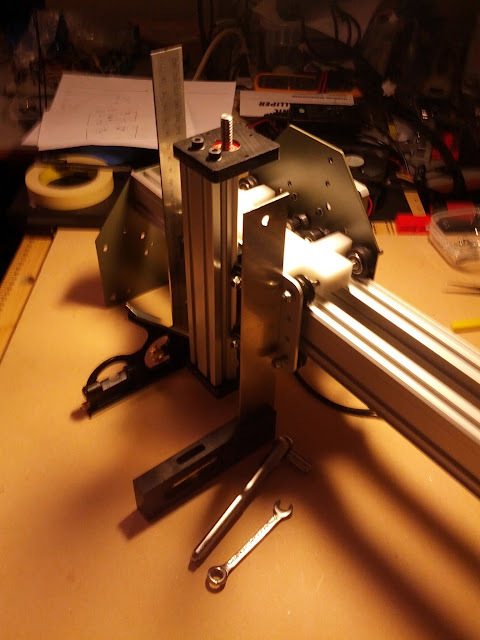 This is what I am planing on making, top and bottom pieces of HDPE and cover of thick plexi-glass at least 5mm or more to be able to hold the inside bearing and provide the additional support to prevent the flexing of the rod due to down force on the pulley from the belt. Also I might just go with all HDPE make it one piece. Nice work you have done so far. 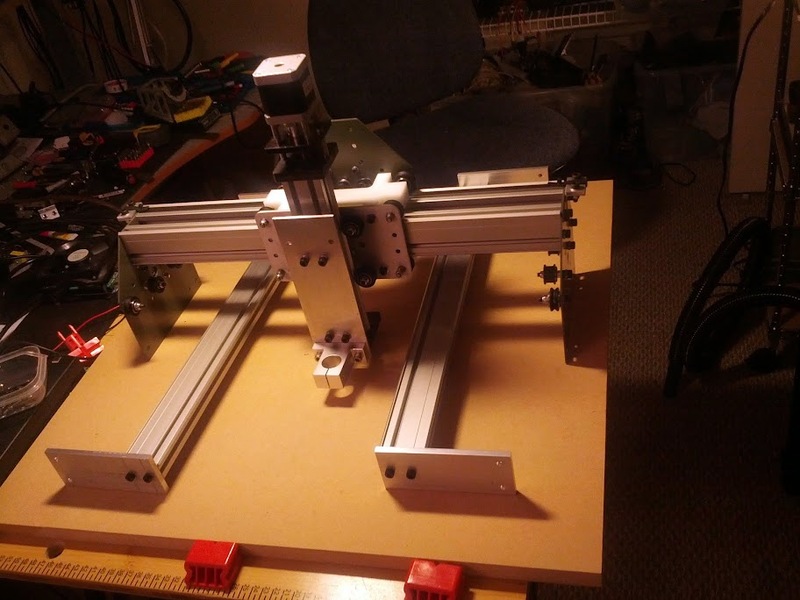 How did you assemble your T-Slot table ? 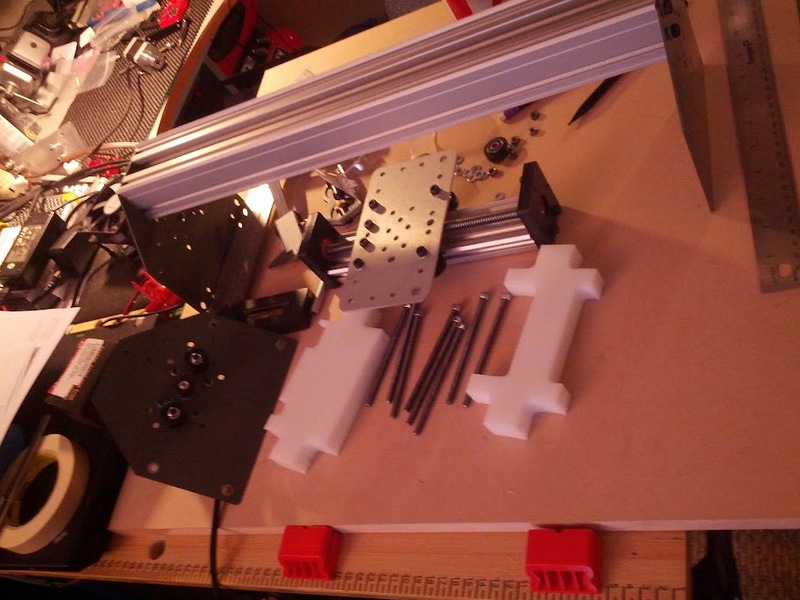 I'm planning to buy these one http://fr.misumi-ec.com/eu/ItemDetail/10302261820.html (HSFQN4-15250), ut I'm not sure how to assemble them together, and with the base extrusion (rail where the plates are).